I love me a good allegory. And allegories in the form of short stories are pretty much the best thing ever. 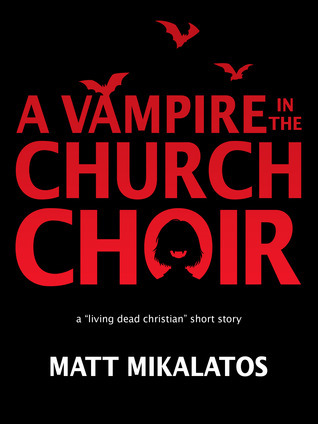 Matt Mikalatos hits another home run with A Vampire in the Church Choir. I loved Imaginary Jesus (now published as My Imaginary Jesus) and knew I had to read AVitCC. We don’t talk about religion much on BtS, and it’s not because we’re ashamed of our faith—not at all! We have both felt that a book blog is just that, a blog about books and bookish things. So, I almost didn’t post this review, because it is a Christian allegory. And I didn’t want to offend anyone. But, in the end, I felt I needed to share my love for this story! This is unique, something I haven’t seen before. I appreciate the originality of Mikalatos’s story. I’ve never seen another Christian author incorporate humor, vampires, and stereotypes…and do it in a way that doesn’t offend, but instead broadens the perspective of the reader. So, while being off-beat, and very sarcastic, Mikalatos spins a tale that takes many issues in the church and reveals them in a different light. A light that makes you take a step back and check yourself to see if you are causing some of the issues, adding to them, or simply not doing anything to make a difference. Nice! thanks for the great review! I'm glad you enjoyed the book. If you haven't checked out Night of the Living Dead Christian, it has Lara in it, also.